Covered in lush rainforests, hundreds of mangrove islands, and coral reefs teeming with diverse marine life, the Bocas del Toro Archipelago serves as a living laboratory for studying tropical biodiversity. This chain of islands is populated by everything from toucans and butterflies to turtles, sloths, and brightly colored poison dart frogs. At first glance, Bocas is nothing short of paradise. Unfortunately, increased tourism on the islands has led to ecosystem and natural resource degradation while also compromising Indigenous islanders’ traditional livelihoods. Our research on the environmental impacts of tourism and development in Bocas provides the community with data necessary to support more sustainable policies and protect the beautiful islands they call home. Spend a semester in the dynamic community of Bocas del Toro, where everything – from the thriving underwater ecosystems to the rich green rainforests – seems more alive. Go behind the scenes in this “paradise” as you study the impacts of tourism and development on the island system’s unique habitats, evaluate local environmental policies, and apply the principles of sustainability and conservation to your research project. Immerse yourself in the dynamic community of Bocas del Toro. Snorkel and hike through diverse environments – from coral reefs and mangroves to cloud forests and rainforests – and study the impacts of tourism on the island system and its people. Meet the local residents who depend on both tourism and natural resources and learn about current approaches to sustainable tourism in Bocas. Among the slender palms and warm sands of Isla Colón lies the Center, a one-time beachfront hotel. 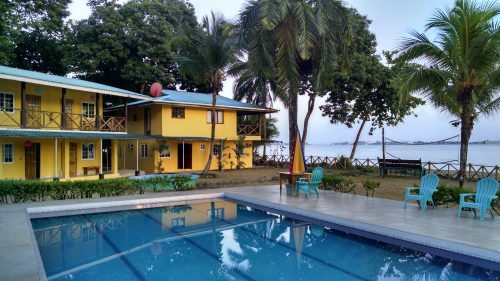 At this idyllic field station, you’ll take your classes in the waves of the Caribbean and the surrounding rainforests. The laidback tourist hub of Bocas Town is a short taxi ride away, with access to shops, restaurants, and a vibrant culture that is as unique as the mix of people who live here. Research is one of the best parts of studying here in Bocas with SFS. The biodiversity and many different ecosystems offered in Panama are amazing to study and prevent us from ever being bored. Research at the SFS Center for Tropical Island Biodiversity Studies focuses on approaches to environmental conservation and natural resource management in the face of threats such as climate change and impacts from increasing tourist activity. Students and faculty engage with indigenous communities, NGOs, fishers, farmers, and business owners as they explore the future of these fragile ecosystems, small communities, and sustainable tourism models. We devote an entire week of our curriculum solely to focus on the impacts of climate change on the small nation of Panama as well as at the local level in Bocas del Toro. Through mock-UN debate, students prepare to address climate change issues facing Panama. Students perform coral bleaching and coral disease assessments within the Isla Bastimentos National Marine Park to quantify the current and future impacts of climate change on coral reef ecosystems. Students explore forests and the ocean to inventory the biodiversity of the Bocas del Toro Archipelago. In addition, students interact with local fishermen and representatives from the Ministerio de Ambiente to gain greater insight into policies that affect conservation initiatives in the region. Students are introduced to lands-rights issues affecting indigenous peoples via their introduction to tourism and development. This is particularly important to understand in the Bocas del Toro region since many land disputes are still active and have profound impacts on indigenous people in the region. Students will hear guest lectures from indigenous lawyers and affected citizens. The issue of tourism impacts is addressed via participant observation and interviews with local authorities and stakeholders, including business owners, Bocatoreños, fishers, tour operators, and visitors. Additionally, students are taken into the field to measure, analyze, and interpret how tourism impacts habitats and ecosystems such as coral reefs, mangroves, and forests. Bocas del Toro does not have a strong written account of its fisheries practices. Our research aims to better understand the state of fisheries in the region, particularly as it relates to the health of marine ecosystems and food security. Students will interview and interact with local fishers in the field and at our Center. In addition, students conduct transects near mangroves and in coral reef and seagrass habitat to assess abundance and diversity of fishes. SFS is an active member of the Bocas del Toro archipelago community. During the program, students organize a snorkel and swim club for children or urban birding festivals and educational talks. Students attend area events and festivals, frequent the shops, markets and restaurants of Bocas Town, and compete in local soccer matches. SFS research data is made available to the local communities, NGOs, and Panamanian government.